Coinciding with the Ealing: Light and Dark season, It Always Rains on Sunday (1947) – given a pristine digital restoration by the National Archive – stands as a remarkable example of the films Ealing made that were somewhat overshadowed by their more popular, overtly comedic titles. Directed by Robert Hamer (who went on to helm perhaps the studio’s most acclaimed feature, 1949’s Kind Hearts and Coronets) and based on the novel of the same name by Arthur La Bern, the film is a soapy kitchen sink crime drama set amongst the working-class denizens of East London, and tells a tale of hidden desire suppressed by societal conformity. Taking place during one rain-drenched Sunday, It Always Rains on Sunday begins by surveying its overarching location: a post-war London still suffering from the ramifications of bombings and deprivation. 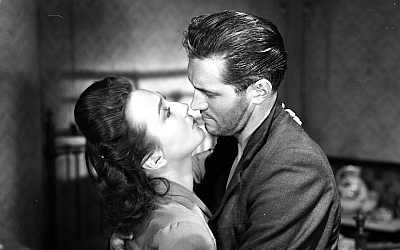 Aided by Douglas Slocombe’s bristling, noirish cinematography, Hamer gradually hones in closer to a gritty, close-knit Bethnal Green suburb until we reach our central protagonist: Rose Sandigate (Googie Withers), a bitter housewife stuck in a dull marriage to George (Edward Chapman), who is much older than her. Resentful of her precocious stepdaughter’s burgeoning social life and stifled by the incessantly nosey neighbours that surround her on all sides, Rose longs for an escape from her dreary lot in life, which dutifully comes in the form of Tommy Swan (John McCallum), who is on the run from the police having escaped from prison. Taking the opportunity to embrace Tommy, who is in fact an old flame from long ago, Rose agrees to hide him in her bedroom whilst she continues upholding the house’s domestic routine, keeping him away from the heated attention of the policemen roaming the streets outside, desperate to find their man. Resembling the type of cinema Terence Davies (who appears as a talking head in the featurette ‘Coming in from the Rain: Revisiting It Always Rains on Sunday’, which accompanies the disc) is now known for: perusals through familial hardships spearheaded by tough, but emotionally vulnerable, matriarchs, It Always Rains on Sunday is a fascinatingly bleak Ealing drama that could be seen as a precursor to the birth of the British New Wave over a decade later. Signposting a distinct change of pace for a studio predominantly known for portrayals of war, Hamer’s It Always Rains on Sunday is both a distinct snapshot of urban England withered by conflict and a depiction of a bustling East End community peopled by market traders, gangsters and crooks, who weave in and out of the central narrative in a series of subplots that add to the feeling of a crumbling society. Embedded amongst It Always Rains on Sunday’s multi-strand narrative is Withers’ Rose, a woman trapped by a drab, everyday marriage within an environment of inescapable and claustrophobic orthodoxy, whose world is rocked by a man who represents the freedom and passions she once enjoyed, however futile they eventually became. In the aforementioned featurette, writer Iain Sinclair notes how Rose “is almost a person of colour in a black and white world”, a world that, in Hamer’s hands, is as austere as it is inherently vibrant in a film of municipal turmoil.